Regardless of where we come from, clothing functions as a highly visible marker of individual and ethnic identity in both the celebratory and everyday realms of life. Articles of clothing worn for special occasions, whether festive or somber, annual or as rites of passage, are commonly referred to as “folk costumes.” In Wisconsin and Dane County, examples that may come to mind range from the Norwegian bunad, German lederhosen, to Hmong paj ntaub. While each folk costume may carry different symbolic significance stretching across generations and sometimes oceans, the wearer becomes, even temporarily, a bearer of traditions and a performer of heritage. 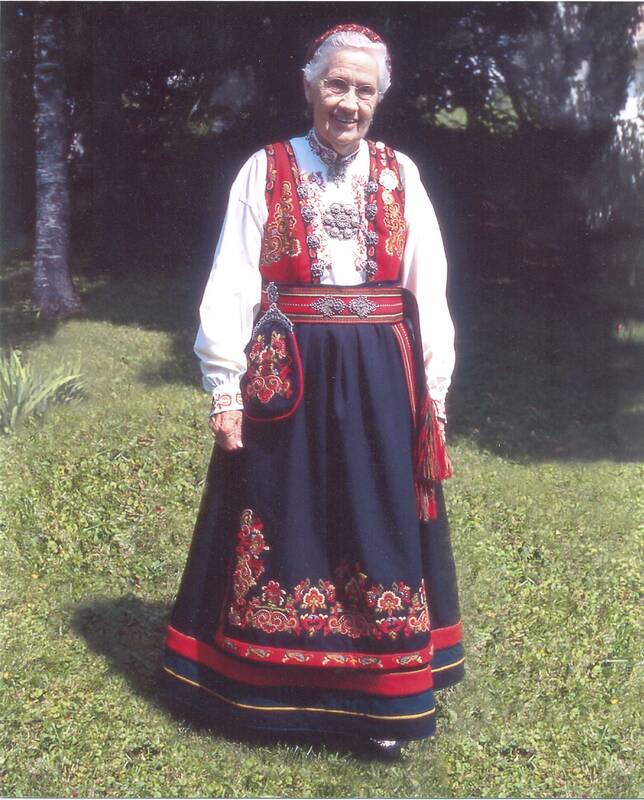 By 1998, Olga Edseth was an active rosemaler in the Mount Horeb community and took this notion of wearing one’s ethnicity to a street-level understanding. That year, while at a garage sale in Dodgeville, Mount Horeb, Wisconsin she came across a hot pink pair of size eight leather pumps. She bought them for fifty cents. Having practiced rosemaling since 1946, Olga was self-taught and practiced for over sixty years, applying her craft not only to her home, where she collected and displayed a massive assortment rosemalled object, but around Mount Horeb. Whether it was a street light or a banner, Olga was happy to apply her craft. Although featuring vibrant floral motifs, such as roses, geometric shapes, and tendrils, rosemaling is characterized by its two-dimensionality. Originally this painting style was applied to wooden surfaces which had been carved or on the interior walls of churches. Over time it came to represent art in the home and was easily expanded to be applied to any wood surface, regardless of various size and purpose. It is utilized in print form for various commercial or decorative usage. These heels must have struck Olga as a new challenge towards which she could apply her craft. Through applying classic rosemaling features, these pumps became a form of heritage “on the go.” The toe of each shoe becomes the central area of focus through its use of a blue and turquoise Rocco C stem motif with a golden center. The sides feature lively acanthus leafs of gold, green, blue and turquoise, with black outlines and accents which meet at the heel. No section is left untouched as the two inch heels are similarly painted with turquoise tendrils. On the sole of the right shoe not only did Olga sign her artwork, but left two notes. The first, at the bridge, reads, “from a garage sale 50 ¢,” and, as if in celebratory laugher, she wrote, “The first pair of shoes I ever rosemaled” along the right edge. Wherever we go, we carry with us the stories of countless generations, and how we perform our ethnic identity speaks volumes to the continuation of the traditions of not only our ancestors, but our community and the role we play in their narrative. 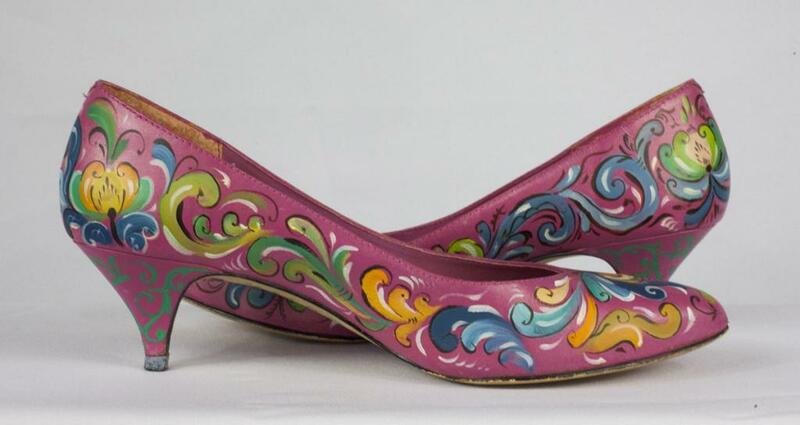 For Olga Edseth, her artwork demonstrates that rosemaling and Norwegian-American ethnicity are far from static traditions, but dynamic expressions of identity one can wear with pride.